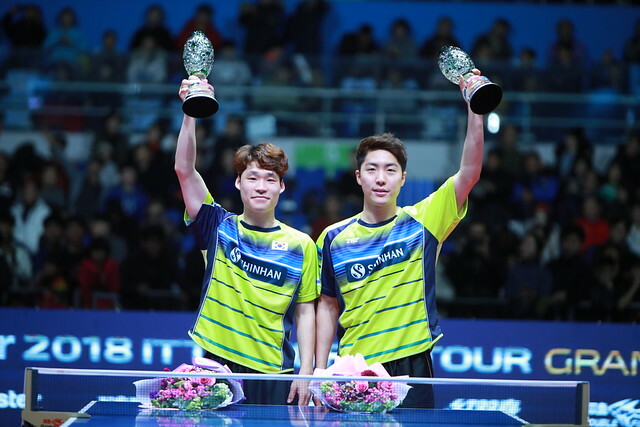 Present in force but following quarter-final defeats for Fan Zhendong and Liang Jingkun earlier in the day on Saturday 15th December in the Men’s Singles event at the Seamaster 2018 ITTF World Tour Grand Finals in Incheon, the mantle of responsibility falls on the shoulders of Lin Gaoyuan. Contrary to expectations he is the one player from China to reach the semi-final stage; the prominent nation is Japan, Tomokazu Harimoto having booked his semi-final place one day earlier but the player on whom eyes focus is Brazil’s Hugo Calderano. The sensational winner in opposition to Fan Zhendong, the no.2 seed (11-6, 12-10, 4-11, 11-5, 9-11, 11-9) Hugo Calderano, the no.7 seed, meets Tomokazu Harimoto, the no.4 seed; the player he beat earlier this year at the quarter-final stage in Qatar. In Qatar, Hugo Calderano was in a rich vein of form and progressed to the final, in Incheon he is in an even richer vein! Meanwhile, in the opposite half of the draw, Jun Mizutani, the no.8 seed, successful against Liang Jingkun (7-11, 11-9, 8-11, 11-3, 11-6, 11-9) meets Lin Gaoyuan, the no.6 seed. In early June at Seamaster 2018 ITTF World Tour Platinum Kaisa China Open, playing in his home city of Shenzhen, the verdict went narrowly in favour of Lin Gaoyuan; now in Incheon, Lin Gaoyuan finds himself in a very different situation being the only Chinese player remaining. If there is such a factor as pressure in sport, Lin Gaoyuan is under pressure; the contest is not a test of his ability, it is a test of his character. Chinese players notable by their absence, at the semi-final stage of the Women’s Singles event, it is the reverse scenario, a full house. Now back at the top of the World rankings, Ding Ning, the no.5 seed, starts as the favourite against colleague, He Zhuojia, the no.12 seed, the winner earlier in the day in opposition to Japan’s Kasumi Ishikawa, the no.2 seed (11-4, 11-9, 11-13, 14-12, 9-11, 7-11, 11-9). Attacking play from the backhand, the side of the racket on which she uses medium length pimpled rubber, throughout the year He Zhuoijia has caused foreign adversaries nightmares. In fact in 2018, her only defeats are against colleagues; Ding Ning with her ability to create angles from the backhand, linked with her strong forehand top spin will prove a very different adversary. Ding Ning the favourite, for Zhu Yuling against Chen Meng simply toss a coin. Arguably Zhu Yuling, having beaten colleague Liu Shiwen in four straight games earlier in the day (11-1, 11-6, 11-9, 11-6), has the momentum. Also, in meetings on the international scene this year, Zhu Yuling won at the Asian Cup as well as on the Seamaster ITTF World Tour in Korea Republic and Sweden; however, in the most recent encounter in Austria, Chen Meng reversed the decision. The evening session of play commences at 7.00 pm (local time).